An 85 Mile Per Hour Speed Limit? An 85 mph speed limit sign is placed on the 41-mile-long toll road in Austin, near the increasingly crowded Interstate between Austin and San Antonio, Texas on Thursday, Sept. 6, 2012. While some drivers will want to test their horsepower and radar detectors, others are asking if safety is taking a backseat to pure speed. In the wide open plains of central Texas, a new addition to State Highway 130 opened for business this week with a compelling marketing hook: Its speed limit of 85 MPH is the highest in America. The 41-mile toll road connects Seguin to Mustang Ridge. There were 32,310 traffic fatalities in 2011, the fewest there have been since 1949. More importantly, fatality rates per 100 million vehicle miles traveled have dropped substantially over the years, falling from 24.09 in 1921 to 1.09 in 2011. Why mess with a good thing. If we raise the speed limits, the highways will become death traps. Just listen to common sense. Everybody knows that speed kills. Maybe we should stop listening to the conventional wisdom, the old wives’ tales, and common sense, because the only thing that seems to be reliable about them is that they will be wrong. Why base traffic laws on mythology? There are many factors that affect the outcome of a traffic collision. Speed is just one of those factors. Wouldn’t it be nice to know what the actual speed limit is, rather than seeing many drivers passing a State Trooper parked on the median, monitoring the speed of the passing traffic, with drivers regularly passing by the Trooper at 75 MPH and not being stopped. Meanwhile there are people driving at what they think is an acceptable speed in the number 1 lane (lane farthest to the left) making the road less safe, because they cause other drivers to change lanes around them. The irony is that many of these drivers are also exceeding the speed limit, but they apparently feel that their level of comfort should be forced on others to make them feel better about whatever. Then there are those who are just unaware of how to behave on the road. Keep to the right, except to pass. That means that we should only move to the left to pass someone, and only when it can be done safely. That does not mean that passing on the right is a traffic violation. No. Governor Bush does not understand “cautious and careful.” If these drivers were cautious and careful, they would keep to the right, as I do, rather than go looking for conflict at highway speeds. A few states permit use of the left lane only for passing or turning left. These have “yes” in the “keep right” column. Six states require drivers to move right if they are blocking traffic in the left lane. Most states follow the Uniform Vehicle Code and require drivers to keep right if they are going slower than the normal speed of traffic (regardless of the speed limit; see below). Motorists may drive Segments 5 and 6 of SH 130 for free until November 11. Beginning November 11, the toll rate will be set at $0.15 per mile for passenger vehicles using TxTag. Cars and trucks without a TxTag may also use the road and will be billed via TxTag’s Pay-By-Mail service. If we don’t want to drive on that toll road, we don’t have to, but there is no good reason to assume that it is any less safe than the roads we would travel on to get to the toll road. 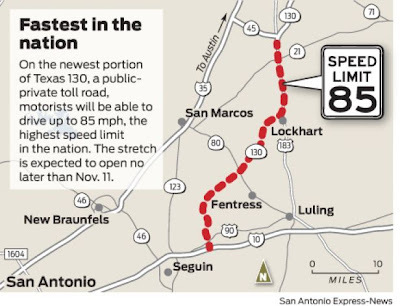 The speed limit is 80 mph on the existing portion of the toll road, which connects Georgetown to south Austin. Open for several years, it’s operated by the Texas Department of Transportation. Is it ironic to tell people that 85 MPH is just too darn fast? Time to Raise the Speed Limit in America?